Bhelith looked out towards Mt. Zìyóu, the largest of the mountain range that the Asteria peaked, in silence, and by herself. She hadn't 'retreated' here, but she came to one of the viewports near the top of the ship on the leeward side to think sometimes. As always, sunlight reigned in the room; pale white paneled walls, occasionally interrupted by the boughs of the tree that housed the complicated ship's lifeblood, with pale flowers blooming towards the open window out into the world, shielded her from the sounds of the rest of the ship as surely as they would had they been her own hidden garden. This far up, she could almost see into the next province over. The view helped her meditate. 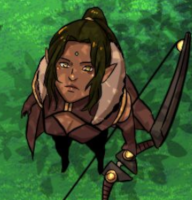 A long, long time ago, Bhelith had eschewed sleeping, following the tradition of many older elves. It had been hard at first, but in the end, she could have more lucid dreams with her eyes open and her mind active during its restive process, though she rarely hallucinated anymore. Her mind had enough trouble to continence and mull. Creature had come to court. Ayana and Edmund had come to court. Something was about to change, though she couldn't quite predict what yet - she would have to nudge the situation a bit to see what nudged back, and from where. The monarch could have been focused on the mountain for minutes, or days, but the sun had almost set when she came out of her reverie to the sound of gentle footsteps. She looked up from the gently curved bench she sat on in the empty solarium to find her space had been invaded by one of the new representatives of the Tai Pan Empire. Her enemy, she thought. Or at least, halfways her enemy. Was it time for this introduction already? She gave the woman a question: "Are you one of the Emperor's, or the Empress's?" This was not how Cixi Xiulan, Imperial Princess of the Taianese Imperial Court, had envisioned her first meeting would go with Duchess Arleigh. The Blackspear. She'd imagined a throne room where the Duchess would have held audience. Courtiers busying themselves in the business of running a suzerainty. A chancellor she would have received the imperial scroll - penned by her father's hand - and handed it over to the Duchess. Polite greetings, likely cooled by shared history, but hopefully warmed by the Immortal Emperor's well-wishes. Her beloved father had always seemed impressed with the Blackspear; which was saying a lot given how impassive he was - in the real and not. This ageless warlord that had survived all their wars, chin high, and kept swinging until in the end, in such a way that even her enemies could find no reproach in her. But instead, she had been led by guards festooned in green-and-gold to this place of quiet. She'd been ushered in and left the guards and Taohua - her handmaiden - behind to seemingly intrude into one of the suzerain's quiet sanctuaries within this rather wondrous treeship. An impression, Xiulan reminded herself, was surely by design: the Duchess, blessed with wiles honed throughout her centuries, surely would not have allowed otherwise. To Xiulan, it seemed like a rather terrific tactic to yank a young dragon princess out of the environment she had previously thrived in - the court - in order to better see her mettle when she stood by her lonesome. The Duchess' first question - foregoing any greeting - struck Xiulan only as wary, only enhancing the feeling of intrusion that had been cultivated ever since she'd come to this veranda. Xiulan carefully weighted why the answer would even matter, and then decided she could change the narrative of this meeting while giving the Suzerain what information she needed to know. "And greetings to you, Duchess Arleigh," the purple-haired dragon princess smoothly answered, not a veiled reproach so much as open pretense that their introduction had begun on better footing - a concession her father's regard had earned for the elven sovereign's no-nonsense show of carelessness. A polite indulgence which would hopefully inspire to do better. She offered Bhelith the taianese fist-and-palm greeting, lowering her head in the same way she would defer respectfully to her older siblings. "My name is Cixi Xiulan. My honored father, Emperor Cixi Kuan Long, has entrusted me with a scroll penned by His own hand. It conveys His heartfelt respects, and covers the reasons for my coming to your lovely home." The dragon princess produced the scrollcase from her obi and held it on display, slitted purple eyes framed in rouge eyeshadow looking just over the black-laquered cylinder. Bhelith inclined her head, though no more than was polite. Though Kowloon remained a suzerainty of the Taianese Empire, she still maintained her demesne in her own right. So she accepted the greeting as seemed proper for generalized court doctrine, though hers differed significantly from the Taianese. The girl seemed clever enough to Bhelith, and some of her polite body language and her answer revealed enough to put Bhelith at ease with her. "Xiulan is a pretty name," she observed. Then, she motioned Xiulan closer, and indicated the seat beside her on the woodcrafted bench. "Come, I shall read your father's letter and we will discuss your new place at court. I understand you shall be staying with us for a while." The dragon princess cracked her impassive facade to offer a slight but appreciative smile at seeing her name complimented. She had few cards to play against her host, whom held all the advantages that venue and experience could offer... but in minutes filled with first impressions, positive reinforcement felt like the best play Xiulan could make. Something about the dark elven ruler's tone felt like they had passed a stage; from being simply wary to... Formality? Familiarity? No, neither of those. More like something done on the Blackspear's own terms, and pursued for a different goal. Interest, curiosity. Good. If those were now Duchess Arleigh's goals, then it felt best to humor them and empower her with the control to reach those goals. Maintaining a bold stance at this point would not be strength; it would be bluster - and bluster Xiulan would be unable to back. After all, by the way the elf had referenced her father, it was clear she'd identified the purple-haired daughter of the Immortal Emperor as a debutante beyond her court; there was no sense in overselling herself. Smoothing down the spines cresting her tail, Xiulan approached the bench she'd been invited to with a "Thank you," and carefully sat down, arranging for her tail curl around her hips and drape down by her right leg. She added an humble "As long as Your Grace finds me of use," as she handed the scrollcase over. Xiulan knew enough that her father would introduce her as the new taianese liason to the Kowlooni court, but the scrollcase was sealed and she was hardly privy to all of its actual content. For all she knew, her father might have included pictures showcasing parts of her childhood in a whimsical desire to help endear her to the Suzerain - the one true constant during the Immortal Emperor's reign was that he always kept the imperial court guessing, even his children (most especially his children). Bhelith cracked open the scrollcase and removed the contents, sliding a little decorative sash away from the parchment and discarding it back inside the box. She unrolled the letter and read it without seeming to hurry, content to all appearances in the peaceful quiet that her sanctuary offered her, even should it prove uncomfortable to some, in such troublesome times. What she read caused her to raise a brow, though only for so long before she looked back to Xiulan, her eyes like deep pools of honey in the dimming sunlight. She let the scroll curl back up, and rolled it idly afterwards, nicking the edge of the parchment with the edge of a short fingernail. Though the Duchess Arleigh wore comfortable, elegant white robes, with her hair eloquently bound up and decorated with the season’s flowers, her hands would have been familiar to anyone who practiced combat in more than the ephemeral sense. Long nails could not easily manipulate weapons. Still, her nails shown a little in the nascent lighting with some sort of polish, and they were tapered enough that Xiulan could hear even the paper’s faint flick. Xiulan had expected the unexpected. Just, not enough. She'd expected to be announced as imperial liaison to the Solarity of Kowloon. Yes, she had no experience beyond the imperial court, but this was where she would cut her teeth into her reason for being. Xiulan found herself ambivalent to her father's request to the Duchess. It was embarassing that he still felt she needed looking after for what she had been created and prepared all her life for this. However, she also felt blessed that her father went out of his way to ask another suzerain for that kind indulgence. Her feelings of ambivalency distilled into a wave of homesickness. With a soundless sigh, she fought past it. That would change the dynamics of the relationships she believed she would build on Piyapon. She would adapt and find a way to make something good out of it. Being a ward of the Duchess might afford her a degree of ease she might not have enjoyed as just an 'imperial liaison'. The dark elven ruler's initial reception was testament to that, if nothing else. "Not in so many words," Xiulan answered, going for an unvarnished reply. "Though, as you have just demonstrated, I can see the wisdom in the request. You just warned me on my wording, when I had meant that you did not have to suffer my presence any longer than necessary; it was stating the obvious, but it served as a vehicle to convey my deference to my host. However, one of your people with a different kind of mastery over The Word could have bound me to litterally attend to you as long as you found me of use, up and until the end of your lifespan." Which was indeed a dangerous promise to make. The dragon princess nodded gratefully to her host. Bhelith held her there with her gaze, her gold eyes surveying the youthful Taianese as though she might cut to the woman's heart and through to her soul, if she had one. Whether she could tell Xiulan’s age or not seemed to be immaterial; the Tai Pan Empire itself had not been in this star system as long as Bhelith had purportedly been alive. Xiulan was a child to the Duchess of Kowloon, the former commander of the last band of humans and elves that had resisted them on their capital city. She fit the scroll back into its case and snapped the clasp, then sat it aside and settled her hands on her white-robed thighs, the few bands that she wore on her fingers showing dull onyx in the lighting. In terms of the luni, Kowloon’s official currency which was based on a battery-like mineral peculiar to tatiya hini sorcerers, those rings represented a fortune. One ring alone would have been worth a country, or perhaps a small continent. The nobility of Kowloon hoarded the metal. Heartstone. The Tai Pan Empire had not been able to eradicate it. Too much of it had left their planet, and they had not yet found a way to control it. The woman in front of Xiulan might have had something to do with that. The outlaw. The elfish bandit, with raggedy ships and strange magic, who had held out with her sword drawn to the very last. Xiulan did not believe for a minute that the Duchess even contemplated refusing her father's request, unless Xiulan herself gave her the excuse of disgraceful behavior. No, this was just like the rest; probing sentences made to better take her measure. If it was different, then it was the unthinkable: the Blackspear didn't feel she either wanted or needed her father's favor. Polite company did not allow Xiulan to entertain such suspicion openly, but did make her feel warranted to display more matter-of-fact bite. Perhaps she was just a girl, but she was also a Taianese princess. It was up to her to make it mean something to the elven ruler. The Blackspear was not the only one capable of making leading statements. "It is rather simple," Xiulan titled her head, the outside light playing over the branches of her smooth antlers. "You have before you someone made with the purpose of being liaison between her empire and its suzerainty. She wishes to fulfill her promise. She is offered a chance to not just be a mayfly, but to shine as a firefly; of course she will take it. Will the effort be worth your time? If you enjoy the joys and sorrows of seeing something grow, perhaps. Either way, you gain something; perhaps a valued contact in the Imperial Court that relates with you. Or perhaps an opponent that will better understand your ways." "Besides," the purple-haired princess tented her fingers close to her own lips. It was a gesture meant to hide a smile; not that she was smiling with anything else but her slitted purple eyes. "We both know the Immortal Emperor 'asking politely' does not mean 'will take kindly to refusal'. I am certain you have sufficient pride to refuse, but I also believe you have the wisdom to continue maintaining my father's practical hero-worhip of you; it is far too precious a boon to waste over something as trivial as weaning a debutante to your court." “At least you’re clever with your tongue,” Bhelith observed, wearing a thin, but nevertheless real smile. Everything she did seemed a little more real. It seemed a talent of elves, and a particular talent of Bhelith’s. Like walking into a fantasy book, it just seemed to sweep up everything around and deposit it in whatever reality existed on the veranda. If there was a script, here, it was a clever one. She sat the scrollcase aside and leaned back against the wickerwork of her bench. “And I teach very few people. It takes time to teach, and my students, my children of the mind, are more my descendants perhaps than the one born of my flesh. It is not something I particularly wish to waste on a Taianese throw-away sent to soak and process and report, in a mathematical or chemical way, the results of her studies to her peers. Do you have some purpose besides curiosity? Where do you see this knowledge taking you, down the years of your life?" The words rolled off her tongue like honey. The contents barely registered a pause in the woman's rich tonality. You had to be a singer to wield the Word. You had to have style to craft the Song. "Do you want power? Money? Are you an idealist, a realist? Are you your father's daughter, your father's slave - or what?" Purple fire flared in Xiulan's slitted eyes. She needed time. The dragon princess found it in the refuge on virtual reality, her digital consciousness emerging hovering next to the bench where the Duchess and she sat. She stood there, and as time slowed to a crawl, she just seethed at this elf whom so enjoyed basking in her own splendor. Xiulan was trying hard to maintain her standing as a Taianese Princess, but like a knife paring meat from bone, the elven ruler was trying to get at the girl. A girl whom admittedly was not all that much without her title. Not at 11 years old. Allowing that would defeat her appointed purpose. Xiulan didn't want this to get personnal, didn't want to just come here and bare herself to someone whom was still a stranger. But there was no point complaining about it; the moment her father than made his intention known that Bhelith would teach Xiulan, she had been put in a position of inferiority - one where she couldn't use the backing of her heritage or nation to lend weight to her. It didn't help that the Blackspear approach was on occasion demeaning. The situation, she resented. The elven sovereign, she found she could not. If she had been in her feet, as old as she was, within the comfort of her own home and presented with a new annoyance... she would probably be difficult too. Time now on her side, Xiulan turned to the answer she needed to give. One that she found not especially forthcoming even to herself in the moment. Her mental metaphor with the paring knife was one she turned on herself. A platitude would bore the Duchess; she had to provide something genuine, sufficiently imperfect and sufficiently real to be of interest. She found it, the core of how she wanted to express herself. If the elf wanted Xiulan to bare more, the dragon princess could humor her. She had plenty more teeth to show! Xiulan left her artificial refuge and time picked up once again as she faced Duchess Arleigh in the real. The brief timeout had helped her collect herself, but she did not feel very kind as she answered: "Ah, but Duchess, you have already given us lessons. We were very reluctant to learn from you when you tried teaching us of War, but surely you will agree that once you broke us in, we picked up on it quite well." "Congratulations. You and the rest of the Tatiya Hini managed to forge a civilization that dreamed for centuries to be better than its forebears in becoming even worse warmongerers," she continued, a bit too fired up not to let her biting sarcasm come through. "One look at the starmap and we can see how fruitful those efforts were, and how much the student has outdone the teacher." Reigning herself in, the purple-haired Taianese princess more cooly continued with: "I have a mother so determined that our people never be hurt again that there is very little she is willing to leave to chance. I find that I cannot blame her, and yet, those effort come so short of what we might have been and of what we could be. You ask what I want of my future? I want to move beyond this sordid and bloody chapter of our history. There is irony in a Taianese expecting to learn more than just of death from the Blackspear, but if you have other lessons to impart beyond that... I might be interested." "But choose the lesson carefully;" Xiulan cunningly warned, dressing up what was in effect a challenge. "Given time, the student still plans to outdo the teacher." It felt like the words dropped into a deep pit. The cavern yawned within the elven monarch’s eyes, gold and inviting and as terrible as a lion’s eyes. Bhelith unfolded like a cat, and rose like a queen. Her hands snaked behind her as she paced over towards the veranda window, looking out upon her personal mountain vista through the glossy haze of the Asteria’s organic glass, which seemed to tint everything a faint green or gold. She turned a little back, white boots making a faint, leathery sound on the polished Yearwood floor. She dipped her head in subtle mimicry of the Taianese court proceedings, and then lifted her gaze to lock onto the youth in front of her. “What we tried to teach you, many, many centuries ago, were principles for living, rather than dying. The ways in which war can be conducted, without loss of life, without loss of face, and without loss of principle. We have always been few, and each Tatiya Hini’s life is long and rich with the time we are allotted – too long to waste in war, when other things more important to the Universe call us. Art such as you will never understand. Beauty, crafted to enhance the natural world. You arrived and called us elves because we reminded you of some thing from your mythology. And yet, our gods, the First Children, wished for us to teach you these things. When we could not, they abandoned us to you chaotic, morbid, vapid little beasts. Centuries and centuries ago. And we have had to live with the violence, corrupted power, and filthy politics that you have engendered since the beginning of your age within this universe. “We taught you magic, and you used it to destroy each other. We gave you maps, and you plotted expansion and ruined empires. We were your friends, by divine order, and you betrayed us each step of the way, in a myriad way. As surely as we offered you our hand, you regularly bit it, driving us out from our homes not once but twice. And that is the difference between humans and animals – humans and other species. Your artificial intelligences mock nature, and profane the truth of the world with artificial numbers, artificial souls, and it allows you to view yourself as an outsider unconnected with the universe. You feel as though you have stewardship. You feel as though you are correct. And you see with only a single pair of eyes, when you could have seen much more beyond that. It is why none of you can sing the Song well, or speak the Words of power perfectly, any longer. It is against your very nature to harness it and direct it to anything other than ruin, and that is not what it was created for. The dusky-skinned elf let the silence fall, and it settled in the room to fill the space her words had left like a blanket. She seemed thoughtful, for a moment, and a little more sad than angry. Bitterness, in a hall of beauty. A small part of Xiulan wanted to feel insulted for being so compared to humans. The history Kowloon's ruler was relating far outstriped that of the few decades the taianese actually shared with the Tatiya Hini. Bhelith was generalizing the Dragon Princess' own culture with all the humans that had come before. Centuries worth of history. Perhaps even millenia. The purple-haired dragon found it demeaning to be grouped so. How utterly naive not to even account for the long trip across the stars, centuries or more played out in virtual reality as those-whom-would-become-Taianese planned for what they would be. Vapid little beasts, indeed! But it was amusement that won out. The dark elf sovereign seemed to want so hard to come across as legitimate. She had faced imprecations from someone whom couldn't have known better since she had not been there back then, and provided testimony. Defensive finger pointing. Justifications. The pain that seemed so righteously entitled to sympathy. The shoulder-bowing weariness that was implied, but dispelled, by the Duchess' poise. Utter hippocrisy. How delightfully, self-righteously proud! Your wounds matter, but not ours. You are just as self-centered as you tout us to be. Like you said, we are perhaps indeed equal in infamy, and I don't see what strutting around bemoaning otherwise really gives you! Despite the cracks Xiulan could see in the facade, Xiulan didn't fool herself. Truth just as much as beauty was all in the eye of the beholder - facts were not all one-and-the-same where different cultures were involved. It reassured her to see Bhelith Arleigh was flawed, but she still had experience that far outstripped the far younger Dragon Princess. She was still an extremely powerful embodiment of history, one her father had given power to. This still left the question of how to approach her stay here. Xiulan's respect for the Duchess had descended to "overrated", but it didn't change her objectives. Kowloon had to prosper; if it floundered like the Wangdaio colonies, then the whole effort of having a fringe province would again be for naught. For Kowlooon to have better oversight, it needed a liaison - that was Xiulan. For Xiulan to become stronger politically, she needed to 'cut her teeth' on this project so any experience she could gain would be valuable. A position of apprenticeship did not entirely dispell that she could represent her nation, but also bestowed on her some margin-for-error. Regardless of her own opinions, she just had to move the conversation to meet that goal. The smoothly rose to her seat. Just slow and deliberate. She grudgingly admired the way Bhelith had risen, it had felt powerful. Xiulan didn't need to come across as predatory just then. "A circuitous question, Duchess," the Taianese princess gently rebuked, her voice smooth as silk. "Asking if I was open minded enough to pay heed to your words in different ways does not change that I answered in the affirmative. What I do of the knowledge is - understandably, I trust - my decision." Slitted purple eyes narrowed in cunning. "Whether you are willing to risk giving something is also your perogative. If you have an history of being hurt for the bother, I would think the lessons of the past would compel you to avoid doing so, but what do I know? As you so clearly put it; I hardly am one of the Second Children. I can hardly know better, now, can I?" She smiled inwardly at the last; how can I be expected to relate if she won't explain? If Bhelith refused tutelage, she would only compound what she complained about. A chicken-and-the-egg dilemma. Xiulan figured she could make it work either way. Xiulan's purple-scaled tail swished this way and that and she offered a coy tilt of her head. "Now that we are introduced, what does concern me at present is the matter of my luggage. As your liaison to Tai Pan, I can operate either from your court, or from the nearby station. I can surely carry out most of my appointed duties either way, but if you prefer I have lodgings here, then I will have my servants offload my possessions from the Hǎixiào." If being assigned here had been a realization of Xiulan’s ultimate purpose in living, her raison d'etre, it seemed something like an annoyance to Bhelith. Or perhaps as though she had realized just the sort of affect her words had caused and been disappointed somehow in Xiulan, or in herself, afterwards. Bhelith might have read further into Xiulan’s internal dialogue than she had intended. Perhaps it had been the upturned answer, the “now can I?’ that had done it, but when the monarch folded her hands inside her robe’s sleeves and looked at her, Bhelith seemed somehow disappointed and resigned rather than offended. Another indignity piled onto a stack of indignities. All that at a glance, and now she seemed weary, like the anger of a century or two had been let out with as much breath. And just like that, the offer was gone, and Xiulan’s position in the court had been defined – an observer, to watch from afar. Bhelith returned to the seat and picked the cased letter up, offering it back to Xiulan with ephemeral, courtly grace, and without the barest hint of shame at declining a request from the Emperor of Tai Pan, even a request that might have been phrased in such a way as to make it just short of an order. "I will send word ahead to ensure you are properly received in keeping with your station. My daughter is not unkind, or unwise, and she will be able to acclimate you, even from afar, with the peculiarities of our domain." Xiulan accepted back the scroll, bowed respectfully, and then took her leave from Kowloon's ruler. She was escorted back to her vessel and before long, the Tsunami had uncoupled from the Asteria to head back into orbit. Back in her quarters, Xiulan let her handmaiden Mina fuss about her until she'd had a bath, her scales oiled and her hair brushed back to a luster. Finally dressed back in a nightgown, the Taianese dragon lounged on a couch by a her chamber's viewport, pensively looking out at the planet below. At face value, her encounter with Duchess Bhelith of House Arleigh had come to a lackluster conclusion. But the more she mulled over what had unfolded, Xiulan found she minded not. The Tatya Hini was formidable, but not monolithic, and from what Xiulan glimpsed during the interview she gleaned several valuable facts she might not have had obtained in a less confrontational encounter. As for her current vantage point: she had a foot in the door, so it could always be improved. Reflecting on her own performance and what the Duchess had obtained from it, Bhelith had been shown that Xiulan had a modicum of cleverness and was courteous to a degree until she felt thriffled with. In the respect of retaining a favorable image of the Empire's strength - which she was representing, the Taianese Princess had displayed some bite. She'd tried to trap Bhelith in her own word-games, using the lever of her father's influence, but failed, and been found to have little traction otherwise. Xiulan was also generally forthright, not stooping to sycophancy even if it would have been to her obvious advantage. This is not such a bad foundation, Xiulan thought. She could work with "think she is clever", "is brashly proud", and "credible". That meant that should Xiulan speak on behalf of the Empire, her words were likely to be taken seriously. Posturing from her was far less likely to be effective. In contrast, the interview with Kowloon's Duchess had shown things the Immortal Emperor's praise had not conveyed to her about the elven sovereign. For starters, Xiulan had scheduled her initial appointment ahead of time with the Chancellor. But when she had come at the appointed time, she was escorted to see the Duchess at her leisure, and deliberatingly treated as if she had intruded at the latter's peace. This was design, not accident, but it had successfully painted Xiulan as the intruder and weakened her position. Bhelith was good, Xiulan was evil. Good and Evil was a black-and-white way of looking at it, but the Duchess' first question seemed to justify the perception. Had Xiulan come at the behest of her father or mother. One was clearly better than the other. In a polarizing fashion, even. In the next sentences, Xiulan had emphasized her father's viewpoint to lead the Duchess to believe he was the unspoken answer and the conversation had clearly eased when it was obvious that the scroll had been penned in Xiulan's father's. Clear bias against her mother, the Empress. The Immortal Emperor asking for his daughter to be tutored started on a circuitous - and bizarre - set of questions that hinted that if Xiulan cooperated that she may greatly change, to the point of turning against what had been so far. "Join the Cult of Bhelith" was what she had irreverently coined the attempt. Only the attempt at recruitment had seemed halfhearted at best, the Tatya Hini promoting it in one sentence and then second-guessing it in the next. When Xiulan had prodded at the contradiction, what came in return was hotly self-righteous. Most importantly, what had largely declawed Xiulan during the encounter was how Bhelith De Arleigh did not seem bound, obligated to, or deferrent to the Immortal Emperor. Acting in the Royal Court's name, Xiulan had expected her word to have far more clout, but Bhelith had completely outmaneuvered her through all these word-games to the point where her loyalty to the Emperor could only be described as lip-service. The Taianese Princess' nose wrinkled at that last thought. This was her biggest problem and the one she had to maneuver the most carefully around. Bhelith could be a old hard-liner letting her pride get the better of her - if it was that, it would be relatively easy to supplant her in favor of a more skilled ruler. But the encounter had felt too manipulative, too calculated, to make Xiulan believe that Bhelith was not wise and shrewd. At the very worse, she felt Bhelith had simply been careless out of whimsy, but never incompetent. This framed a suzerainty with a ruler that believed she could be independent and flaunt it to a daughter of her old enemy, the man she stewarded the territory for. What if - if - the Tatya Hini sovereign had the strength, the loyalty, the preparedness and the resolve to make such a stand? That sounded foolish, and Xiulan reminded herself that her assessment of Duchess De Arleigh was 'competent'. Then, why would the Duchess have telegraphed this much? If she was that shrewd, would she not expect Xiulan to come to these conclusions? Unless she didn't care. That had been the enduring theme of their meeting. Perhaps the Duchess counted on her bluntness to keep her guessing. But guessing at what? The Dragon Princess' ribcage stretched as Xiulan took in a calming breath. She needed more information before she could stoop to alarmism. A trail of breadcrumbs was already offered, and she could already do much better than work from incomplete information and impressions. Xiulan's mousy attendant emerged from her shadowy nook. "Yes, Princess?" The Mouse Form Taianese handmaiden had been brought up from her second class family and practically raised alongside Xiulan. Unless in public, decorum was usually kept at a minimum. "Play your Ehru for me." Mina went to fetch the chinese fiddle and as her bow coaxed notes out of the instrument, Xiulan turned her slitted purple eyes back to the planet. Xiulan closed her eyes. For now, she had to stop over-analysing. She had confidence the answers would come in time.